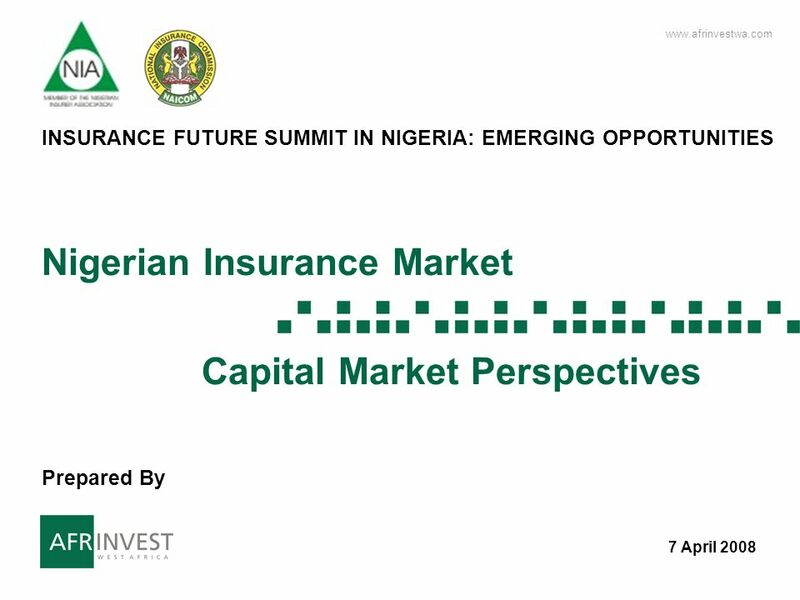 Www.afrinvestwa.com 1 1 Nigerian Insurance Market Capital Market Perspectives 7 April 2008 INSURANCE FUTURE SUMMIT IN NIGERIA: EMERGING OPPORTUNITIES Prepared. 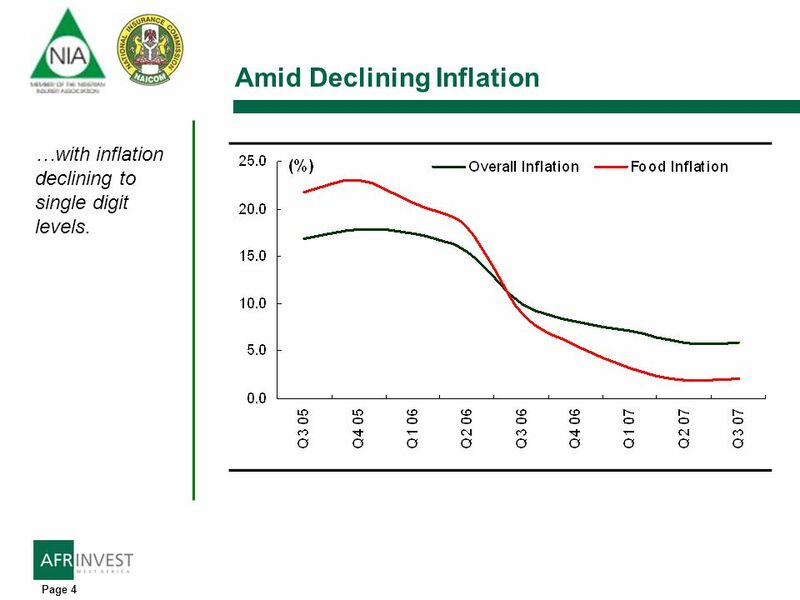 4 Page 4 Amid Declining Inflation …with inflation declining to single digit levels. 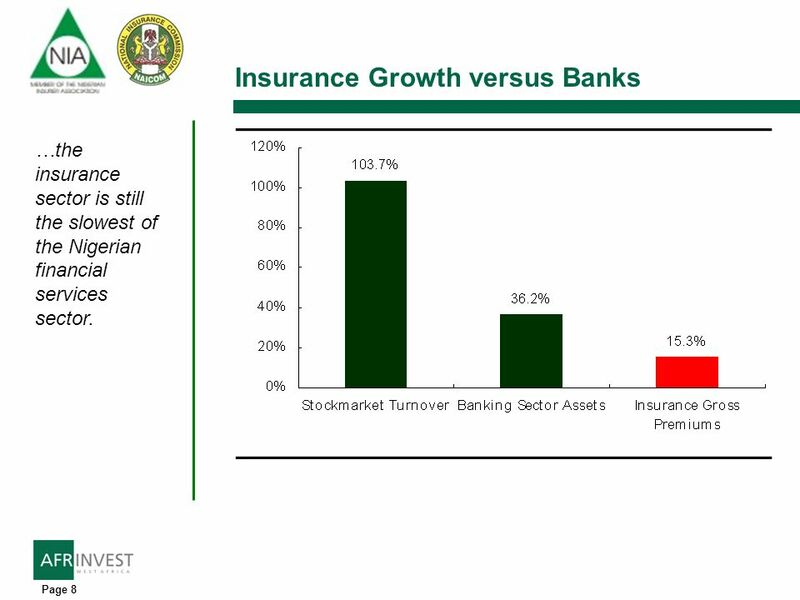 8 Page 8 Insurance Growth versus Banks …the insurance sector is still the slowest of the Nigerian financial services sector. 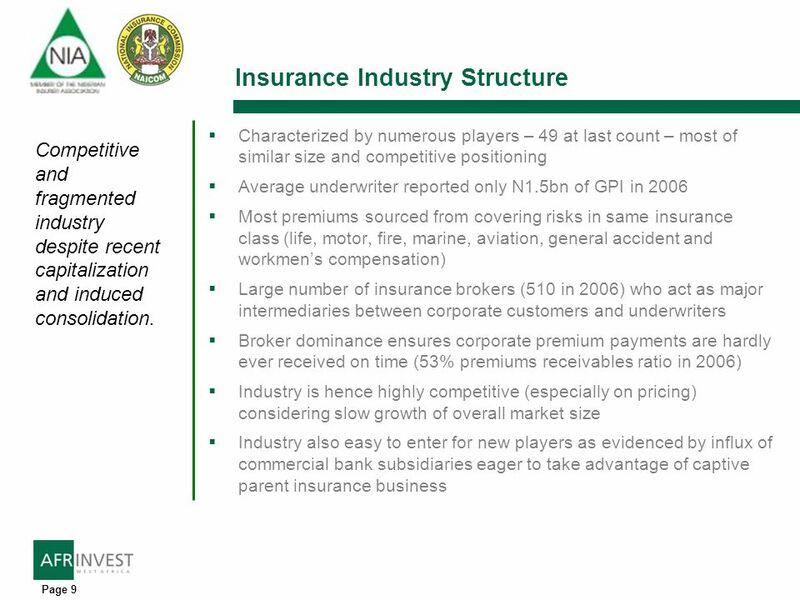 9 Page 9 Insurance Industry Structure Characterized by numerous players – 49 at last count – most of similar size and competitive positioning Average underwriter reported only N1.5bn of GPI in 2006 Most premiums sourced from covering risks in same insurance class (life, motor, fire, marine, aviation, general accident and workmens compensation) Large number of insurance brokers (510 in 2006) who act as major intermediaries between corporate customers and underwriters Broker dominance ensures corporate premium payments are hardly ever received on time (53% premiums receivables ratio in 2006) Industry is hence highly competitive (especially on pricing) considering slow growth of overall market size Industry also easy to enter for new players as evidenced by influx of commercial bank subsidiaries eager to take advantage of captive parent insurance business Competitive and fragmented industry despite recent capitalization and induced consolidation. 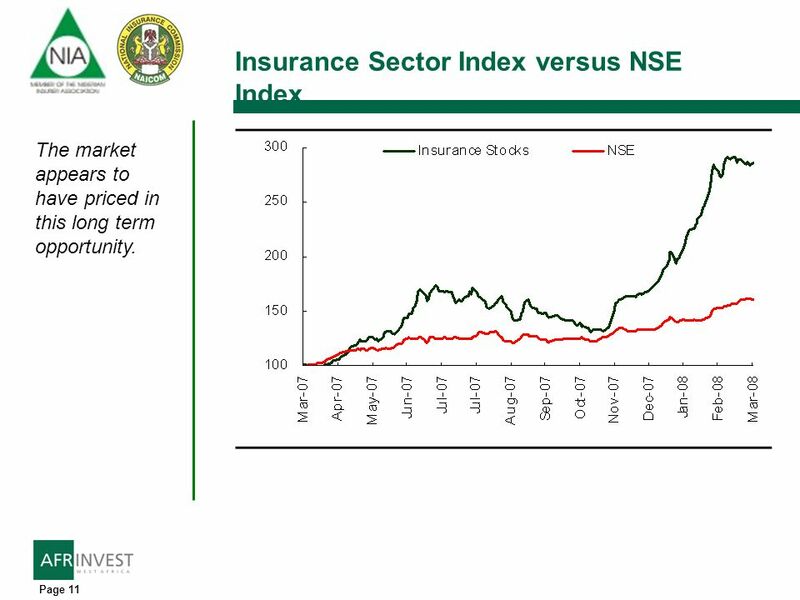 11 Page 11 Insurance Sector Index versus NSE Index The market appears to have priced in this long term opportunity. 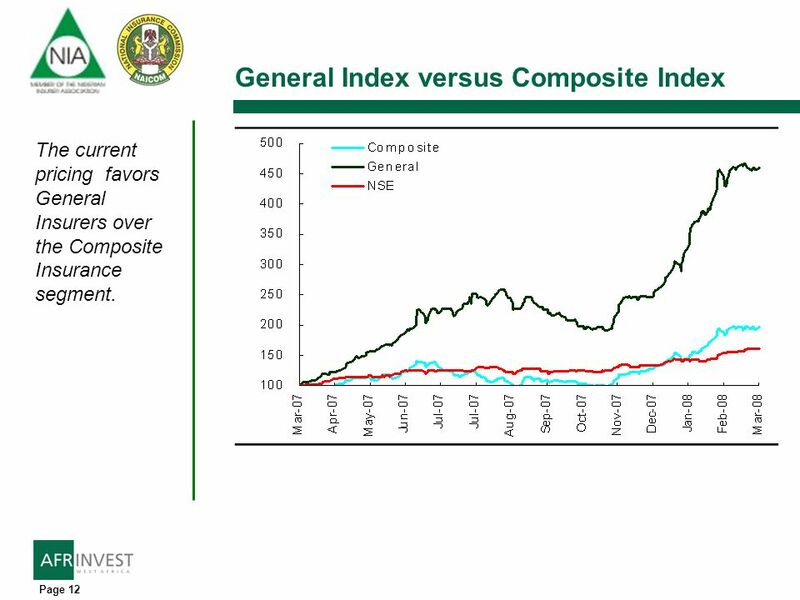 12 Page 12 General Index versus Composite Index The current pricing favors General Insurers over the Composite Insurance segment. 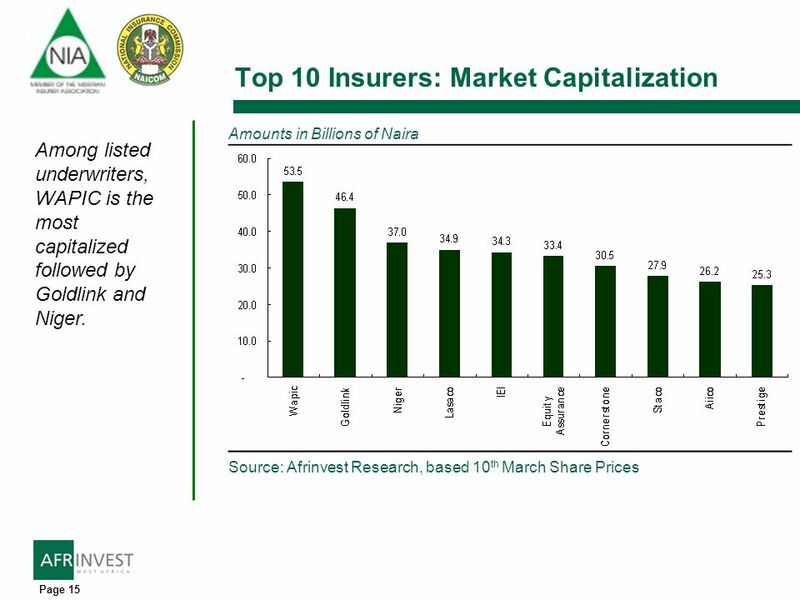 13 Page 13 Top 10 Insurers: Shareholders Funds Source: Afrinvest Research, based on most recent public data Amounts in Billions of Naira Leadway, WAPIC and IGI are the leading players by shareholders funds. 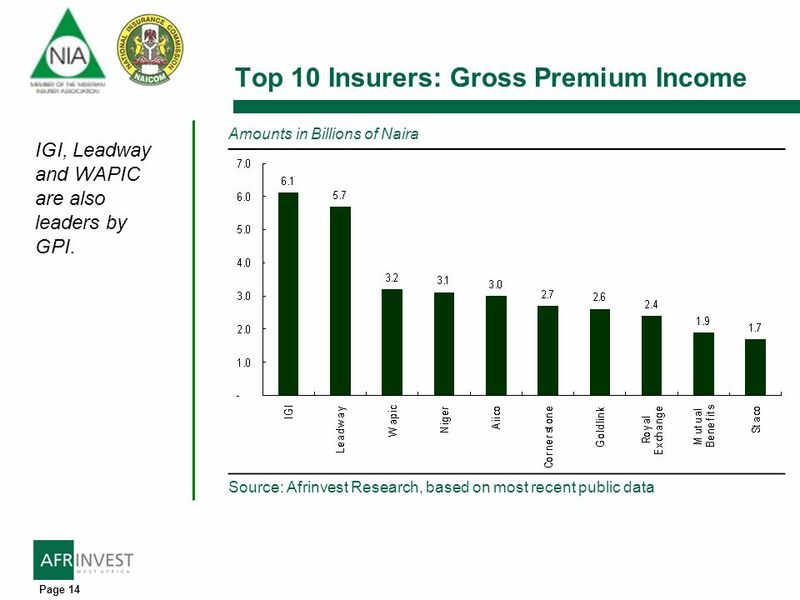 14 Page 14 Top 10 Insurers: Gross Premium Income Source: Afrinvest Research, based on most recent public data Amounts in Billions of Naira IGI, Leadway and WAPIC are also leaders by GPI. 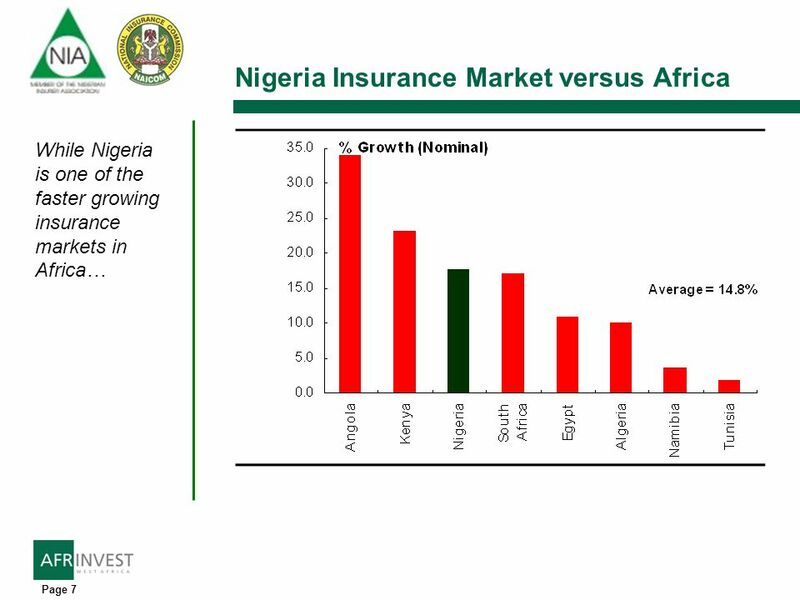 15 Page 15 Top 10 Insurers: Market Capitalization Source: Afrinvest Research, based 10 th March Share Prices Amounts in Billions of Naira Among listed underwriters, WAPIC is the most capitalized followed by Goldlink and Niger. 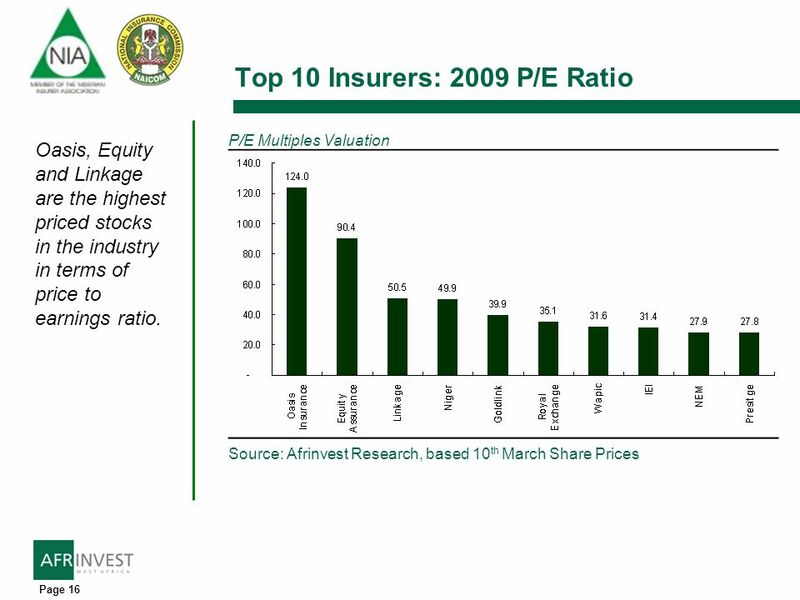 16 Page 16 Top 10 Insurers: 2009 P/E Ratio Source: Afrinvest Research, based 10 th March Share Prices P/E Multiples Valuation Oasis, Equity and Linkage are the highest priced stocks in the industry in terms of price to earnings ratio. 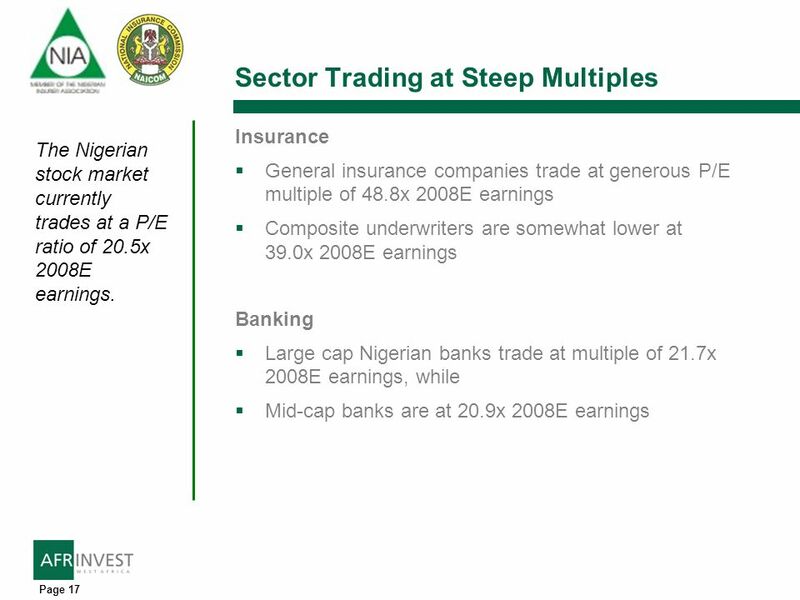 17 Page 17 Sector Trading at Steep Multiples Insurance General insurance companies trade at generous P/E multiple of 48.8x 2008E earnings Composite underwriters are somewhat lower at 39.0x 2008E earnings Banking Large cap Nigerian banks trade at multiple of 21.7x 2008E earnings, while Mid-cap banks are at 20.9x 2008E earnings The Nigerian stock market currently trades at a P/E ratio of 20.5x 2008E earnings. 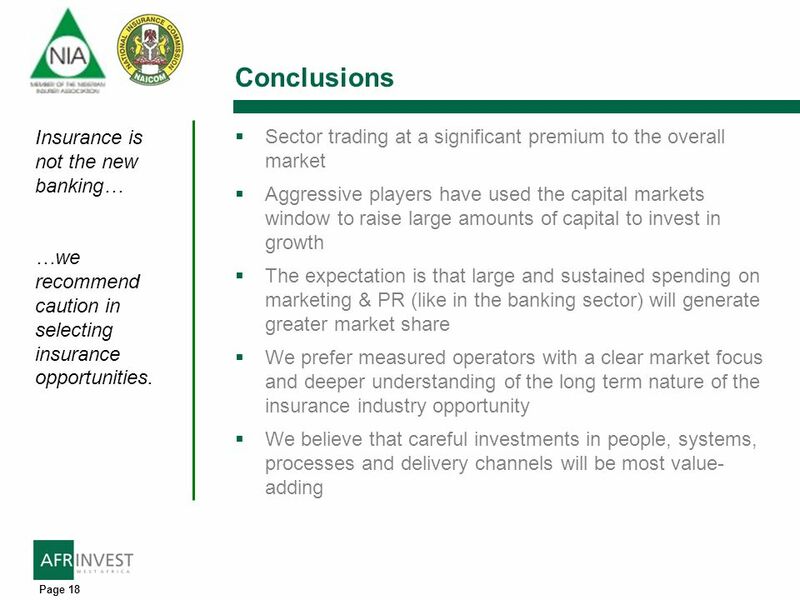 18 Page 18 Conclusions Sector trading at a significant premium to the overall market Aggressive players have used the capital markets window to raise large amounts of capital to invest in growth The expectation is that large and sustained spending on marketing & PR (like in the banking sector) will generate greater market share We prefer measured operators with a clear market focus and deeper understanding of the long term nature of the insurance industry opportunity We believe that careful investments in people, systems, processes and delivery channels will be most value- adding Insurance is not the new banking… …we recommend caution in selecting insurance opportunities. 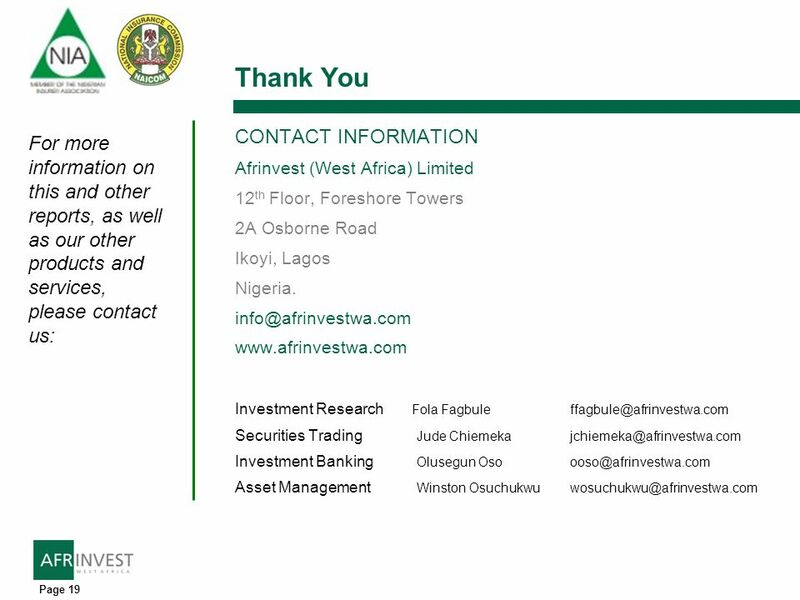 Download ppt "Www.afrinvestwa.com 1 1 Nigerian Insurance Market Capital Market Perspectives 7 April 2008 INSURANCE FUTURE SUMMIT IN NIGERIA: EMERGING OPPORTUNITIES Prepared." 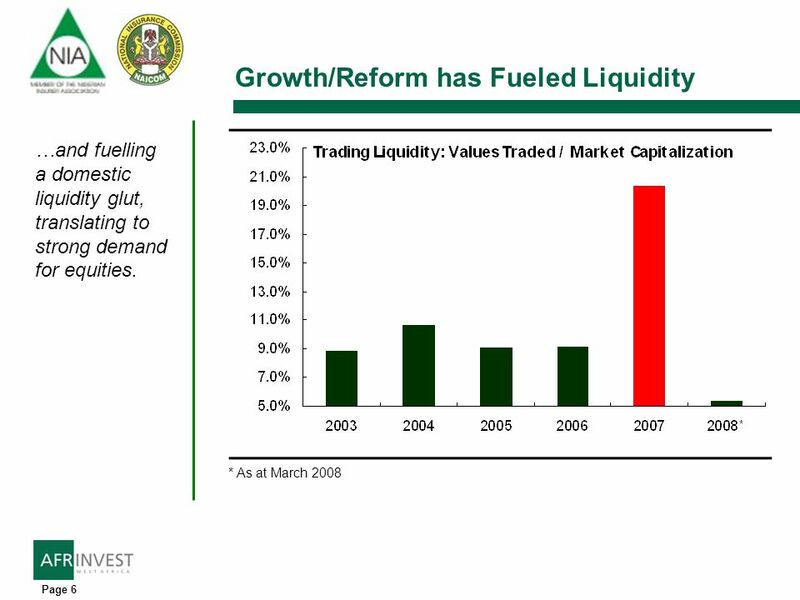 Financing the Future Roland Stephen April 15, 2009. ® 1 Rudiments of Credit Analysis May 18, 2001 Credit for Bluffers – Part I. 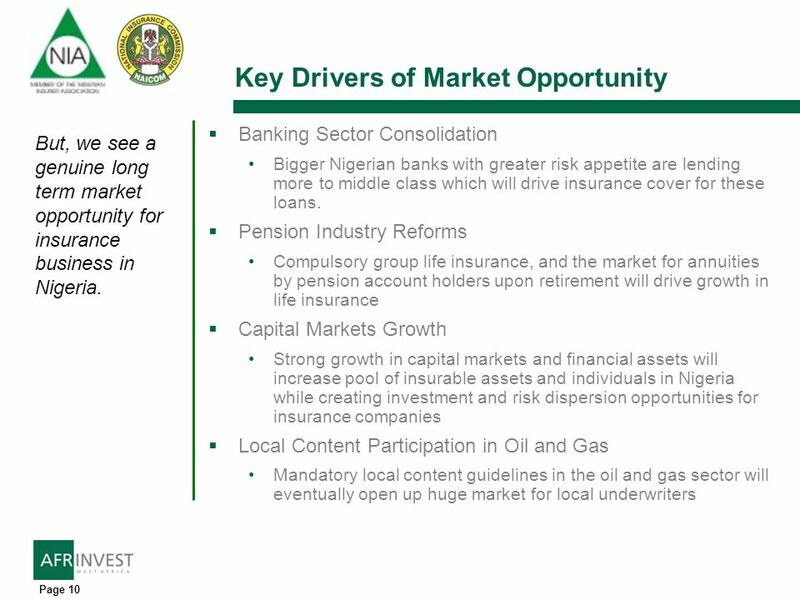 1 THE CHALLENGE OF DEVELOPING LOCAL CONTENT AND CAPACITY Presented By Abiodun A. Omilabu Director (Operations) National Insurance Commission INSURANCE. 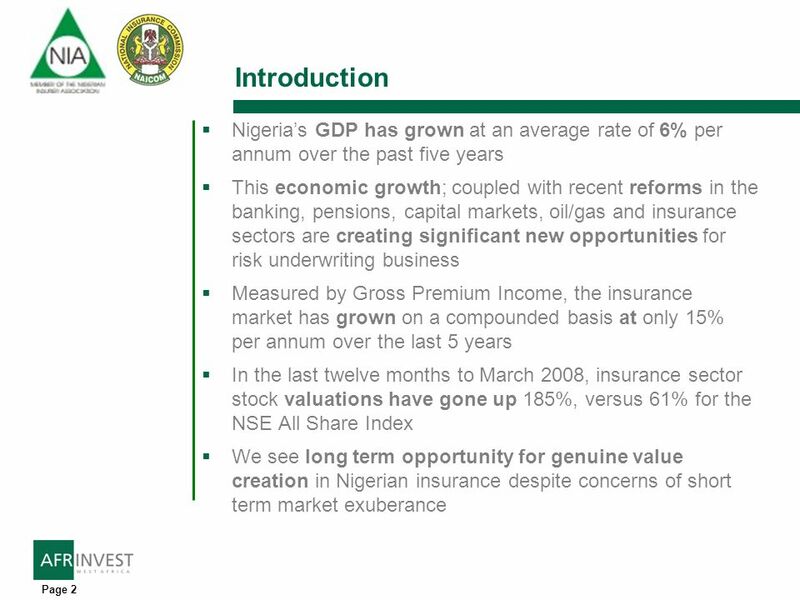 Insurance as an Engine of Growth and National Development – Challenges of the Present and Future by Rotimi Okpaise. BULGARIAN CAPITAL MARKET AND THE ROLE OF BULGARIAN STOCK EXCHANGE 7 th INTERBALKAN FORUM OF BANKING ASSOCIATIONS Sofia, May 4 th Ivan Takev, BSE-Sofia. 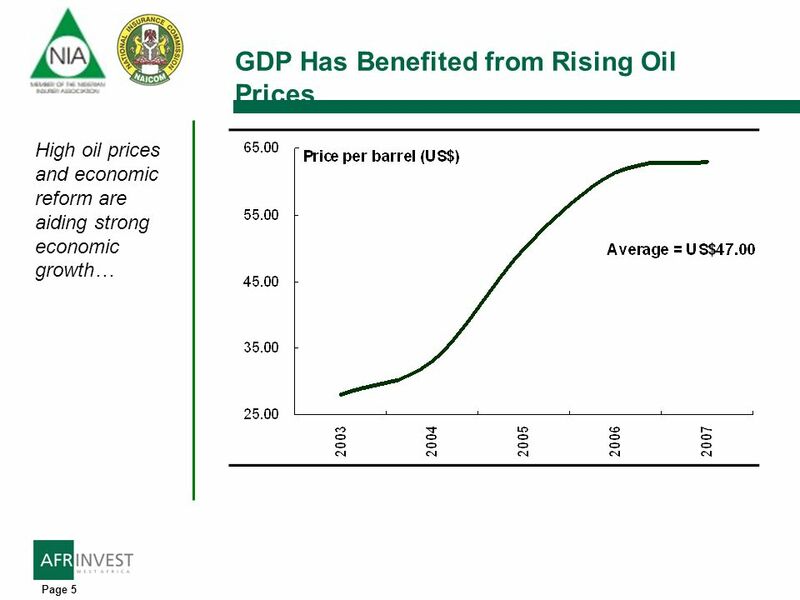 The visible hand of China in Latin America Opportunities, Challenges and Risks Javier Santiso Chief Economist & Deputy Director OECD Development Centre. 1 Giuseppe Cinquegrana Researcher National Accounts directorate Istat OECD Working Party - Paris, 30 November 2010 Debt and net financial wealth: a comparative. Chinas Economy in the Post- Crisis World Carnegie Endowment for International Peace Washington DC, 17 March, 2010 Pieter Bottelier. Copyright © 2009 Pearson Addison-Wesley. All rights reserved. 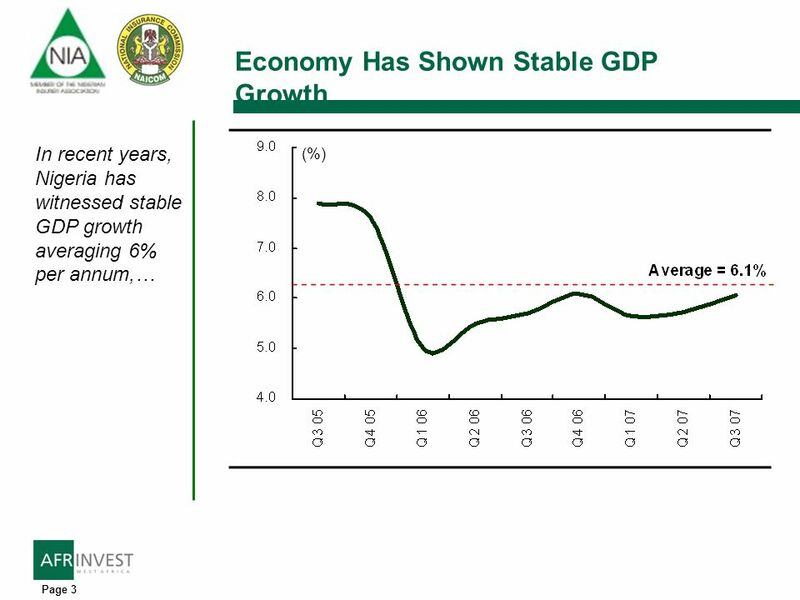 Chapter 13 Balance of Payments, Developing-Country Debt, and the Macroeconomic Stabilization.